At the Angelus, Pope Francis explains the meaning of the Eucharist: "Jesus to enter into communion with Him" and to "share with Him the gift of life for the world". "It is so important to partake in communion, to go to Mass and receive communion to receive this living Christ". A call to solidarity with the people of Kerala and recitation of the Hail Mary. Young Ukrainians for peace. 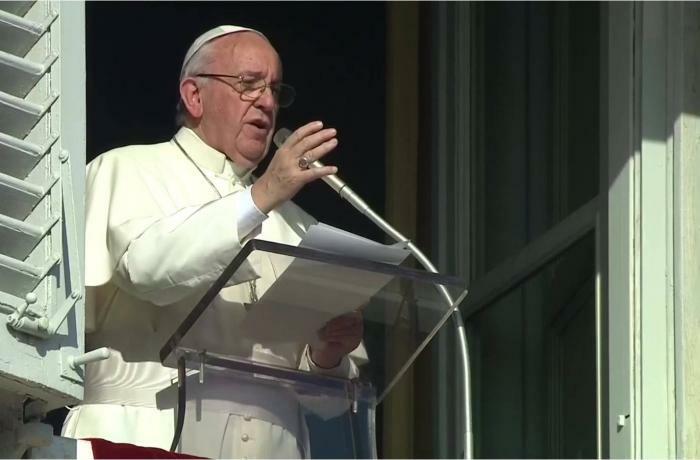 Vatican City (AsiaNews) - How to "render fruitful the evangelical love we receive in the Eucharist" was the path traced by Pope Francis in his commentary on today's Gospel (20 th Sunday by year, B, Jn 6, 51-58 ), before the Angelus prayer with the pilgrims gathered in St Peter's Square. After the Marian prayer, he launched an appeal for the flood victims in Kerala (South India), calling for the solidarity and help of the international community. The Pope's comments were inspired by the discussion that arose among those listening to Jesus when he offered himself as "living bread descended from heaven" and adde that "the bread that I will give is my flesh for the life of the world". "When the symbol of shared bread leads to its true meaning - Francis explains - that is, the gift of self to the point of sacrifice, misunderstanding emerges, even the rejection of the One who wanted to lead in triumph emerges". With the invitation to "eat" His flesh and "drink" His blood, "Jesus invites them to enter into communion with him, to" nourish themselves of "his humanity, to share with him the gift of life for the world. Other than triumphs and successful mirages! It is precisely the sacrifice of Jesus who gives himself, shares himself among us ". "This bread of life - continued the Pope - the sacrament of the Body and of the Blood of Christ, is given to us freely at the table of the Eucharist .... The Eucharist molds us so that we do not live only for ourselves, but for the Lord and for our brothers and sisters. The happiness and eternity of life depend on our capacity to make fruitful the evangelical love we receive in the Eucharist ". "Jesus - he concluded - repeats today to each one of us:" If you do not eat the flesh of the Son of man and drink his blood, you do not have life in you "(v. 53). It is not a material food, but a living and vivifying bread, which communicates the very life of God. When we go to communion we receive the very life of God. To have this life we need to nourish ourselves with the Gospel and the love of our brothers and sisters. Faced with Jesus' invitation to nourish ourselves with His Body and Blood, we might feel the need to argue and resist, as did the listeners of today's Gospel. This happens when we struggle to shape our existence on that of Jesus, to act according to His criteria and not according to the criteria of the world. But He never tires of inviting us to His banquet to fill ourselves with Him, "living bread descended from heaven". By nourishing ourselves with this food we can enter fully into harmony with Christ, with His feelings, with His behavior. This is why it is so important to communicate, to go to mass and receive communion to receive this living Christ ... May the Virgin Mary support our purpose of communion with Jesus Christ, nourishing ourselves with His Eucharist, to become in turn bread broken for our brothers and sisters" . After the Angelus, Francis recalled "the inhabitants of Kerala ... hard hit by intense rains, which caused flooding and landslides, with heavy losses of human lives, numerous missing and displaced people, and extensive damage to crops and houses". "May the concrete solidarity and support of the international community not be lacking to these our brothers and sisters. My thoughts are with the Church in Kerala, which is on the front line in bringing relief to the population. May we all be close to the Church in Kerala too. Let us pray together for those who have lost their lives and for all the people tried by this great calamity ". And after an invitation to pray in silence, he recited a Hail Mary together with the faithful in the square. Finally, greeting a group of young Ukrainians present, he encouraged them "to be operators of peace and reconciliation".